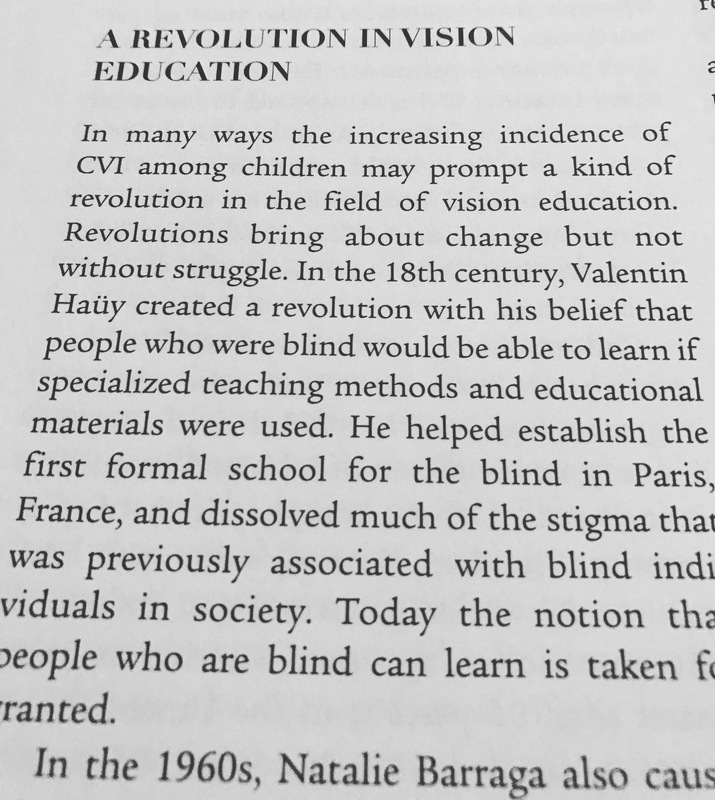 From Cortical Visual Impairment, An Approach to Assessment and Intervention, by Christine Roman-Lantzy. Recently the Chicago Tribune published an article, Programs for visually impaired students face teacher shortage, describing the nation wide shortage of vision teachers to serve students who are blind or visually impaired. Any parent of a child who is visually impaired can attest to the shortage of teachers of the visually impaired (TVIs), and orientation and mobility specialists (O&Ms). But the author missed the bigger story. As any parent of a child with cortical visual impairment (CVI) can tell you, it is almost impossible to find a TVI who is proficient in CVI. Our children with CVI, who often comprise half or more of a TVI’s caseload, are overlooked and poorly served. It is the same phenomenon for parents all over the country. Over and over, the same story, My child’s TVI does not know CVI. My child’s TVI does not know what to do for my child who has CVI. My child’s TVI does not know the CVI Range, or how to plan CVI interventions, or how to write appropriate IEP goals. How can this vast lack of knowledge exist when CVI is the leading cause of visual impairment in our kids? Among the graduate level vision teacher preparation programs in the US, exactly one has a required class on cortical visual impairment. UMass Boston has taught CVI for several years, and a year ago, made their CVI course and learning about CVI mandatory. Ellen Mazel, author of the CVI Teacher blog, teaches the required CVI course. Her CVI Teacher posts are frequently shared by Start Seeing CVI. Perkins School for the Blind offers a host of both onsite and online continuing education courses in cortical visual impairment. In addition, they offer the Perkins-Roman CVI Range Endorsement. The Endorsement recognizes TVIs who are proficient in CVI, and reassures parents that the TVI working with their child understands CVI, understands their child, and understands how the child seees. Continuing education is important, but training in cortical visual impairment remains optional for teachers of the visually impaired. It has been nearly seven years since my son’s infant stroke at birth, and the first time I heard the words cortical visual impairment. My son’s diagnosis of CVI was not optional. TVI training in cortical visual impairment should not be optional.